Selling homes in the winter months can pose challenges as fewer buyers want to venture out in the cold. Traditionally, the period from Thanksgiving through New Year’s Day is the slowest time of year for home shopping. But for motivated buyers and sellers, staging for the season can really help warm up a home and possibly help get it off the market sooner. First, make sure all of the rooms in the house are evenly heated. If a certain room or area is noticeably colder than the other, you run the risk that the buyer may assume the home has heating issues or lacks efficiency. One of the easiest ways to brighten up a home is to literally brighten it up. 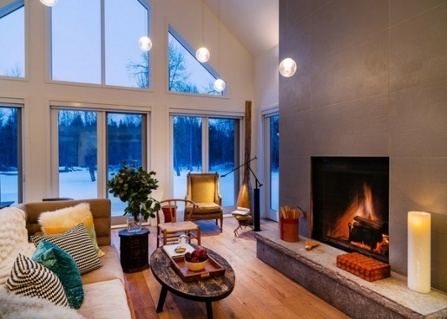 In the winter, days are shorter and darker, so have rooms well-lit to make the home feel welcoming. Push back curtains and fold up blinds. Replace dark lamp shades with lighter ones and increase warmth with accent lamps. Mirrors are also excellent diffusers of light when strategically placed close to lamps or windows. If you live in areas with heavy snow, display a photo of the home/property in the spring or fall season so people can see what to expect in a few months. Home staging isn’t just for the indoors. Areas that are hit harder in the winter months are often covered with snow; there are no leaves on the trees and the curb appeal can be quite lacking. To make the front of the home more inviting, follow these suggestions. First things first, make sure there is safe access to the driveway and walkway. A snowplow service is worth its winter weight to keep the property safe and tidy. Don’t forget to clear any pathways that will be walked if viewing outdoor areas such as a guest house, detached garage, etc. Place slip-resistant mats in areas of high traffic. Make sure the front door is in excellent shape by giving it a fresh coat of paint or stain. Decorate the porch/walkway with potted plants, a cheerful doormat, and/or a bright wreath. Window boxes with winter-blooming shrubbery will also offset the bleakness of barren trees.